So far we have only reported rumours from the Big House where most of the team are staying, we are now in a position to report facts. 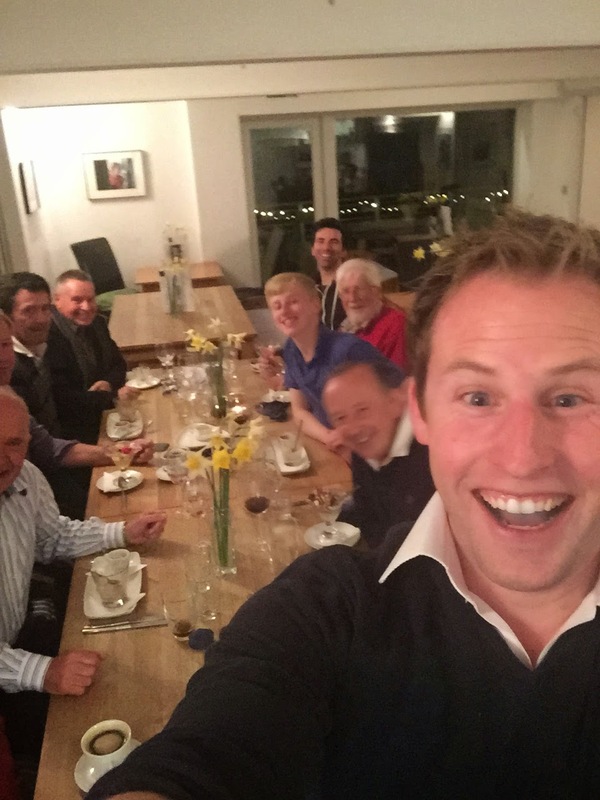 On Saturday night they went to the River Café in Glasbury, where they seem to have had a good time. 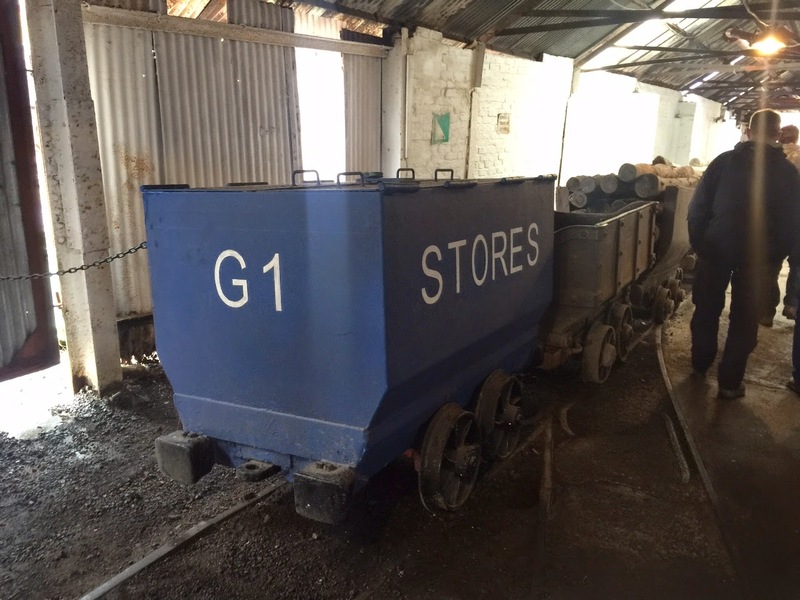 Yesterday a contingent set off to the Big Pit in Blaenavon, well worth a visit but unfortunately closed when they got there. They did however get to inspect Glyn's new trailer. 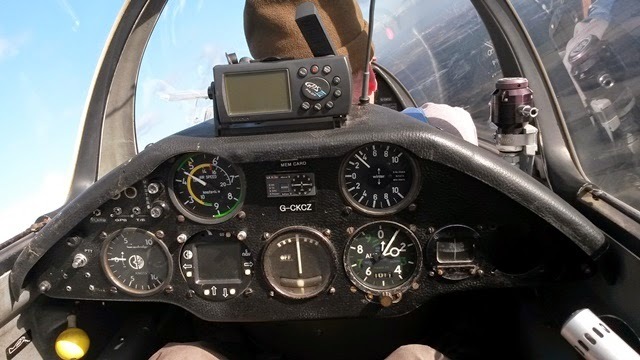 In the evening they had roast beef, and passed the time teaching cadet George how to play poker, a useful skill for a glider pilot, though possibly not on the BGA syllabus. And this morning - guess what - we went flying! The forecast predicted rain by noon but the rain hadn't checked the forecast and stayed away until 1330. The ridges were working well up to Hay Bluff and down the valley to Crickhowell, so we had some fun while it lasted. We hope to do some more of this sort of thing tomorrow........but on the other hand we have staked KCZ down very securely. The clocks went forward last night, so we woke even earlier to hear the rain and wind howling round the house. 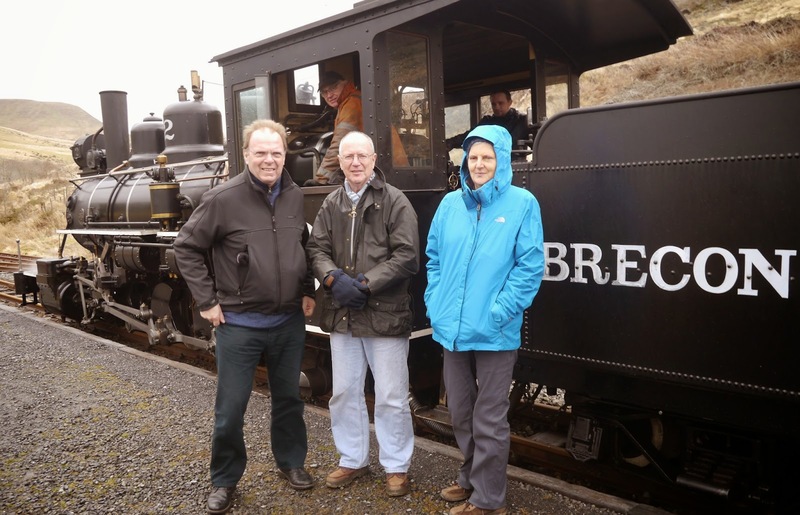 However, a search for 'things to do in Wales' produced a plan to visit Merthyr Tydfil for a trip on the Brecon Mountain Railway. Three coaches and a steam engine - and lots of steam. We trundled up the valley past a couple of reservoirs, then back again, stopping off at the Steam Museum and café. We drove back via Talybont to check out the reported landable fields in the area - which were mainly stuffed with sheep and lambs. There is however a good long flat field (with no sheep) at the end of the reservoir. Nick has come round for dinner (roast pork, roasted veg), he drove over to Aberystwyth to see the sea. 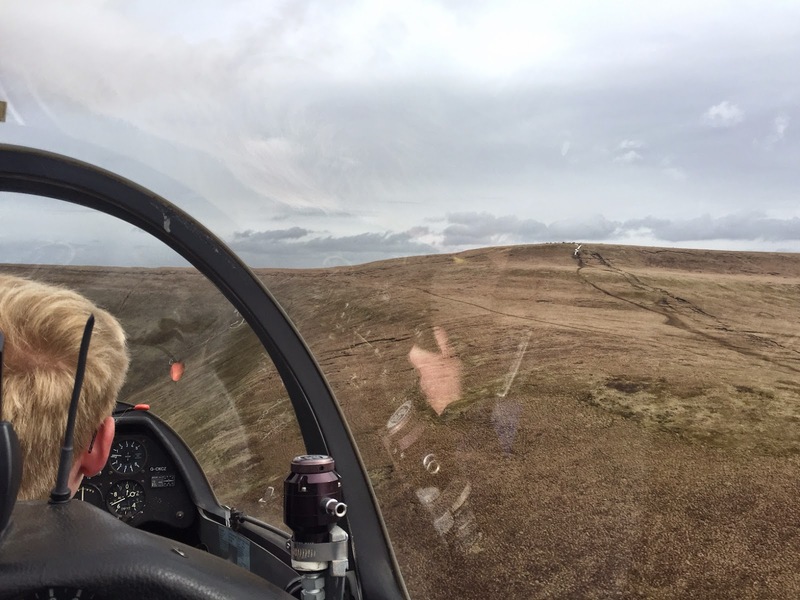 Yesterday he visited Long Mynd where they were winching - 30kts onto the ridge, no problem. Tomorrow it looks as though it will be worth getting up early - fingers crossed - this is after all a gliding expedition. Well, here we are again in Wales, and what a beautiful place to be. 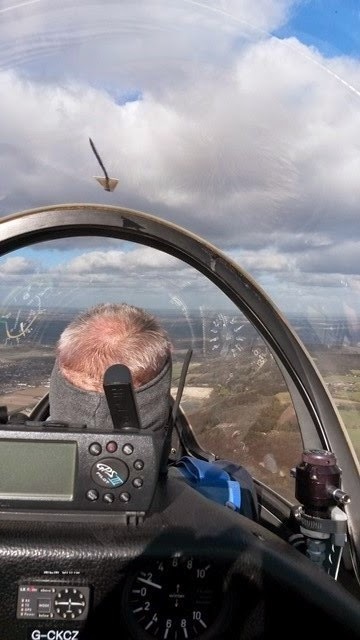 Yesterday when most people arrived, it was sunny and clear, so several members were able to get their check flights done, and Glyn flew one of his models. Today we awoke to wind and rain, less than optimal for gliding - or even standing upright. The local briefing indicated that the rain might stop later, but that the wind would continue, and as there was a significant southerly component, launching would not be possible as none of the take off runs would be anywhere near into wind. Jim maintained his optimism for a couple of hours but in the end conceded defeat. Food report: so far your correspondent has only sampled the Castle Inn in Llangorse, which does a nice line in pies. The sirloin steak was apparently excellent - meat supplied by WJ George in Talgarth - and the sweet potato chips were delicious. Today there was an expedition to the Honeypot Café in Talgarth which was reportedly very good. 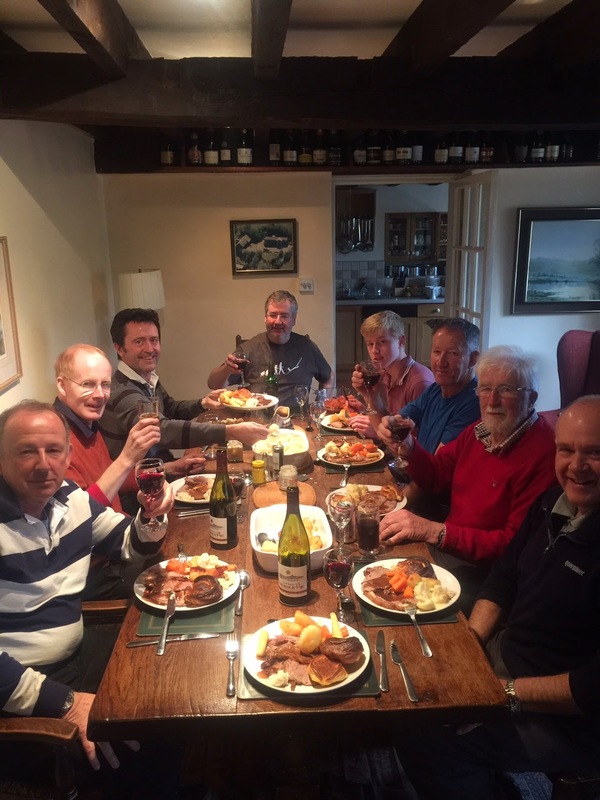 The gang in the big house in Pengenfford have roast beef to look forward to, courtesy of Jim, who is a man with high standards - he complained bitterly that Symeon had given him breakfast on a cold plate. Here in Llangorse we will be having cod in lemon sauce, followed by a bit of Metallica. 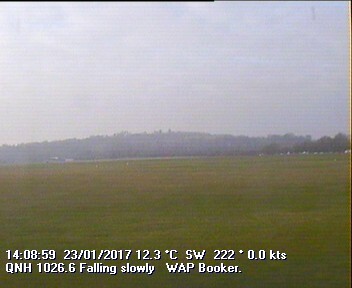 The promise of good soarable weather gave the club another busy day today. More club members turning up for check flights and cross country tasks set for the single seaters. Many chose to stay local, but a couple of Bicester Didcots were flown despite the very rapid spreadout and poor recycling of the thermic conditions. 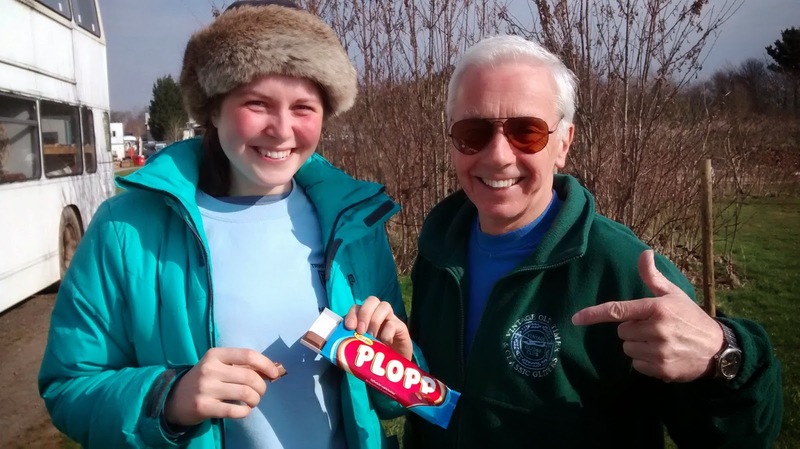 It was cold at the launch point despite the sunshine, but Siena gave us a welcome energy boost when she shared around her Plopp. Last week RAF Benson hosted an Air Users Awareness Day. The aim being to share more about who flys what where and how we can all continue to do this safely. Watch out in the next newsletter for a fuller description of the days events and information that came out of the greatly beneficial day. What was significant is that one of the main focal points was in respect of Gliding in and around the area and Richard Crockett gave a great presentation on the topic - it was clearly well received judging by the interest and questions raised by the attendees from local flying clubs - so much so that Richard has been asked to give the same presentation at White Waltham. 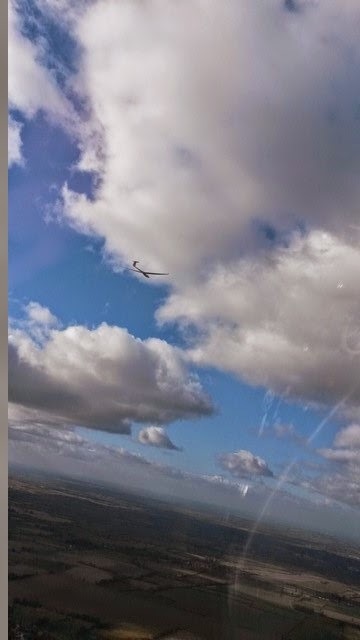 There was a chance to see the aircraft operated from Benson and Booker took a glider along for participants to look at close up (and not as a result of an airprox). 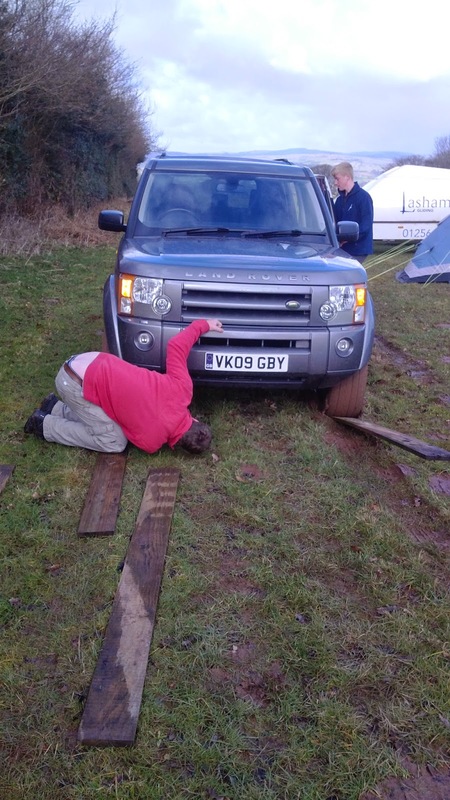 The better weather has also brought a lot more folk out of winter hibernation and it is good to see the launch point busy and pilots taking some launches before they head out to Talgarth/Shobdon for the first of the years main expeditions. If you aren't current (or as current as you would like to be) don't waste time, get up to the launch point and take some launches - there is always something new to learn. 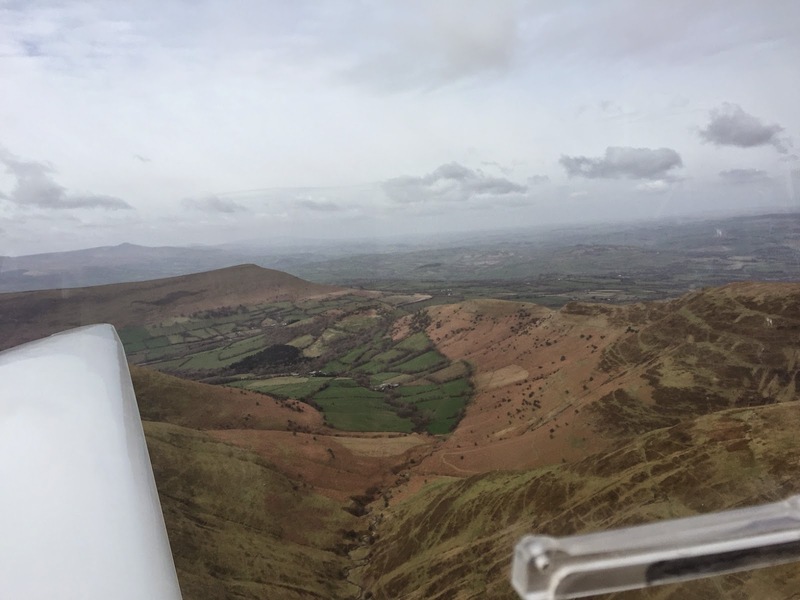 February ended with a great soaring day (for the time of year) and several soaring flights and cross countries by J1M and AJ (BIC-DID) and observations that the task was set too small! Today's forecast NWly and unstable airmass promised some flying on the ridge and the prospect of a good soarable sky. AJ, EN and J1M set off for the ridge but quickly realised the sky was looking too good to stay there and set off X/C - not sure where they got to, maybe the ladder will reveal? Rolf decided he wanted to have a look at the ridge and set off in KCZ for an hour or so before climbing in a thermal to get the height to get home. Finally late in the day John H set off for some soaring under a sky that still looked good at 16:00.